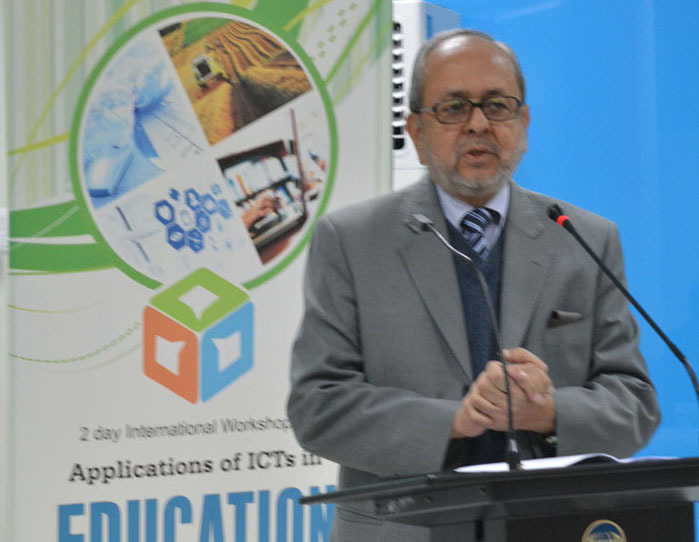 COMSATS co-organized an International Workshop on ‘Applications of ICTs in Education, Healthcare and Agriculture’, in Islamabad, on December 15-16, 2014, in collaboration with Islamic Educational, Scientific and Cultural Organization (ISESCO); Inter Islamic Network on Information Technology (INIT), and COMSATS Institute of Information Technology (CIIT). Over 50 scholars, researchers, subject-experts and academicians from Ban gladesh, Egypt, Iran, Jordan, Morocco, Pakistan, Senegal, Sudan, and Tanzania participated in the workshop that was aimed at highlighting the potential of ICTs in revolutionizing various sectors of the economy. 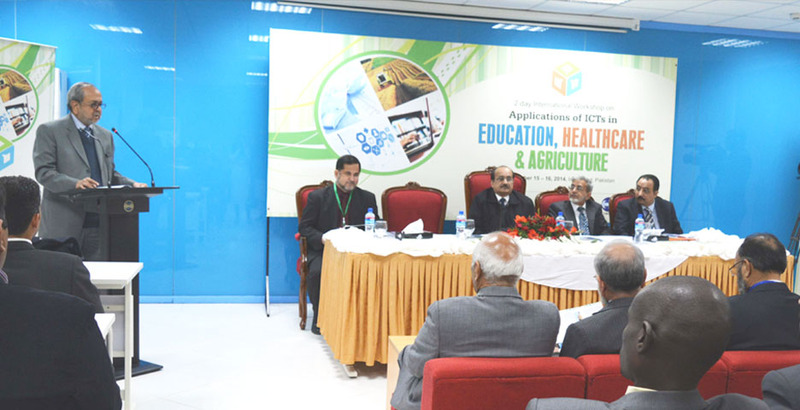 In all 17 presentations were made in the three thematic sessions of the workshop spread over two days, which focused on the applications of ICTs in Education, Healthcare and Agriculture. Deliberations focused on the different ways of building competitiveness amid growing challenges of globalization and rapid technological advancements. The presenters shared their experiences and expertise in the light of their successful projects and initiatives in their respective countries. 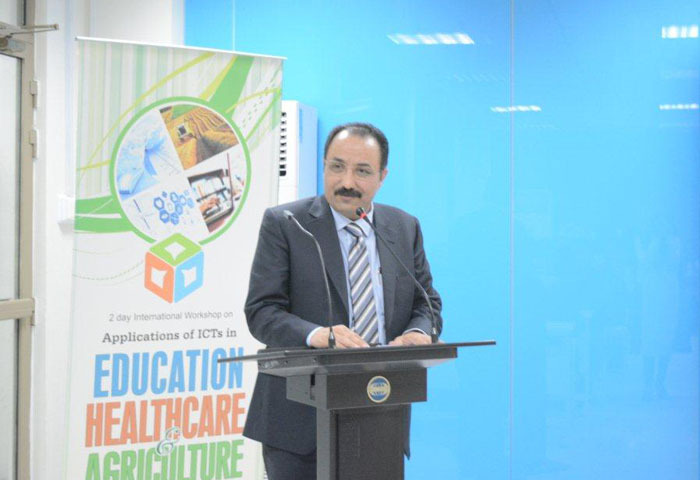 The inauguration of the workshop, held on December 15, 2014, was presided over by Dr. Tahir Hijazi, Member (Governance, Innovation and Reform), Ministry of Planning, Development & Reforms, Government of Pakistan. Other guests of honour at the inauguration included, Dr. Imtinan Elahi Qureshi, Executive Director COMSATS; Dr. S. M. Junaid Zaidi, Rector CIIT and President INIT; and Mr. Ismael Abdel Hamid, Expert, Science Directorate ISESCO. In his address as the Chief Guest, Mr. Hijazi acknowledged the efforts being made by organizations like ISESCO and COMSATS in promoting the use of latest technologies in its Member States. He emphasized the need for the developing countries to give due attention to diffusion of new technologies in their development plans. He noted that technological revolution is bringing a paradigm shift in today’s world. If a nation wishes to develop and grow at a fast pace, it has to opt for latest technologies that are creating headways. In this regard, he expressed Government of Pakistan’s commitment to exploit potential of various technologies, especially those related to Information and Communications. While noting the growth attained by COMSATS university over the last 15 years, Dr. Hijazi expressed pleasure and deemed it an exemplary Institute for a developing country like Pakistan. He particularly acknowledged the remarkable progress made by CIIT in terms of its number of publications per year. Dr. Imtinan Elahi Qureshi, Executive Director COMSATS, noted with satisfaction his organization’s strong working relations with ISESCO and INIT. Sharing some key aspects of I.T revolution the world has experienced in the recent years, he believed there are three major aspects to it: the I.T ecosystems, accessibility, and the content. The revolution, he noted, is dominated by the developed countries and the starting point for the developing countries to gain from this revolution would be to contribute to the content element, which is in conformity with the local needs and social values. He hoped that the participants of the workshop would lay greater emphasis on the content aspect of the I.T revolution. Mr. Ismael Abdel Hamid, Expert, Science Director ISESCO, appreciated the support and cooperation of COMSATS in jointly organizing a number of international capacity-building events over the years. He considered these events good examples of the South-South cooperation benefiting the common Member States of the two organizations. In this context, he particularly made a mention of the success of regional consultative workshop on National Innovation System and Intellectual Property, held in Morocco last month in partnership with COMSATS. Dr. S. M. Junaid Zaidi, Rector CIIT and President INIT, noted that the organizers have very wisely chosen the theme of the workshop, which can help improve the socio-economic conditions of masses. 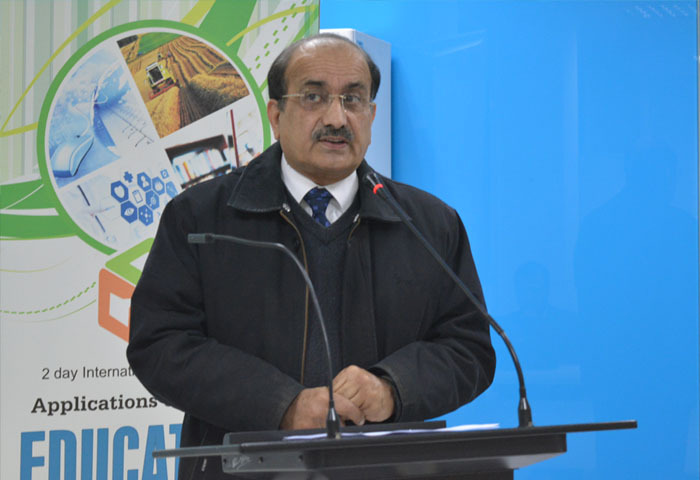 Earlier, an introduction to the event, its various themes, and expected outcomes were touched upon by Dr. Sajjad Mohsin, Dean, Faculty of Information Sciences and Technology, CIIT. The presentations made during the first technical session ‘ICTs in Education’ focused on ICTs for modern skill acquisition; diffusion of ICTs in early schooling; digital watermarking system for e-Education; monitoring and learning education scenarios in Senegal; and persuasive techniques for effective education. Deliberations on the use of mobile phone technology for healthcare; COMSATS Tele-health project; Tanzanian Tele-health case study; Dengue monitoring in Pakistan; as well as psychotherapy through digitization, were made during the second technical session titled ‘ICTs in Healthcare’. While on the second day, the participant of the workshop benefited from technical deliberations focusing on decision support system for agriculture; digital soil mapping of newly reclaimed areas for agricultural uses in Egypt; irrigation optimization for improving crop production; use of agriculture research management information system in Bangladesh, as well as the various ICT applications in agriculture in Sudan. The event concluded on December 16, 2014, on the note of commitment to exploit the full potential of ICTs for improving the day-to-day life of a common man in the developing world. 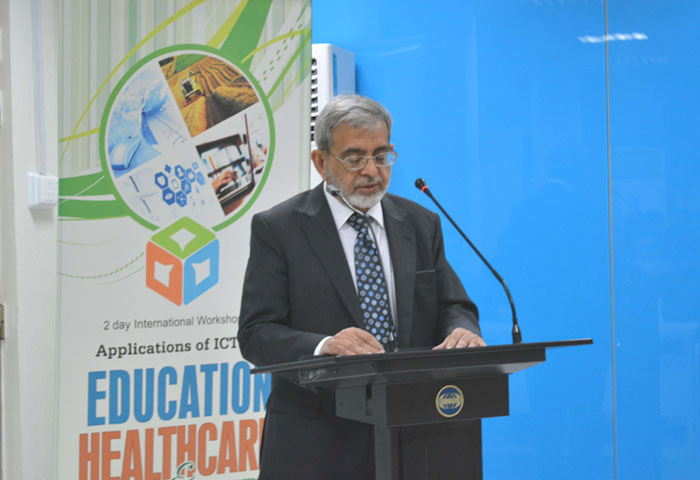 While giving Vote of Thanks, Mr. Tahir Naeem, the Executive Director INIT, noted that the inspiration gained from the technical talks and experiences of subject experts, strengthens our belief in the multifaceted ways ICTs can be beneficial in education, healthcare and agriculture. At the end, certificates of participation were distributed by Dr. Junaid Zaidi, Mr. Ismael Abdel Hamid and Mr. Tajammul Hussain, the Advisor (Programmes) COMSATS Headquarters.